Vembu NetworkBackup offers advanced retention policy which lets user to retain multiple versions of a file on backup server. 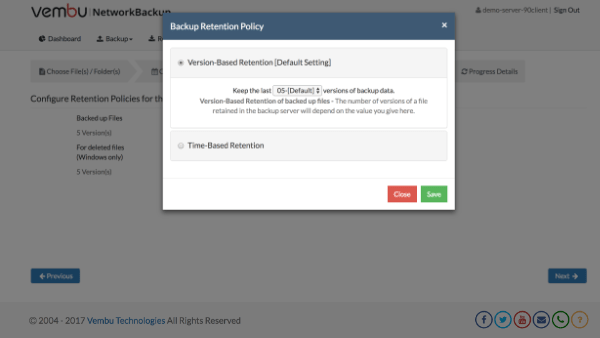 This feature allows user to configure retention policies for backup and deleted files based on two factors: version based retention and time based retention. This advanced retention policy provides user with multiple restore points during recovery. Advanced retention policies are user defined in Vembu NetworkBackup which can be configured during backup job creation and modified later, if needed. Retention cleanup will be initiated based on the retention policy configuration, when a backup schedule gets completed. 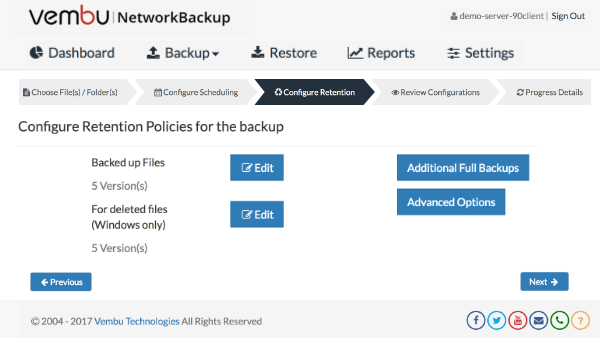 Backup retention policy offers user a choice to retain multiple versions of a backup file that are being modified over various backup schedules. Example: If retention period is set to 1 year, backup server will have multiple versions of backed up files stored for 1 year. Delete retention policy offers user a choice to retain deleted files in backup server which are actually deleted from client machines.